Set of hanging Christmas tree decorations in a shape of elves or gnomes. These felted fellows will be very happy to spend winter holidays with your family. 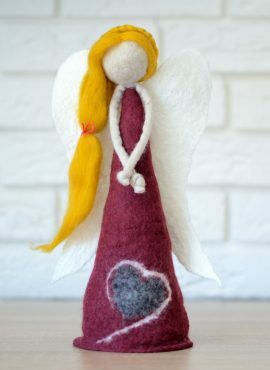 This felted Christmas decoration will make your home look gorgeous! It is Rudolph the Red Nosed Reindeer - the most recognizable animal of holidays. 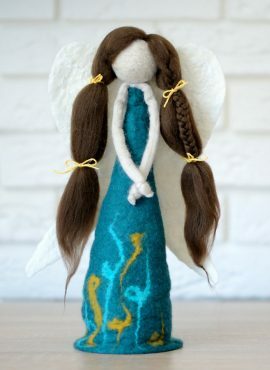 Felt angel figurine to put on a table, windowsill or shelf. It can be also used as a Christmas tree topper or part of a nativity scene. Felt Christmas decorations - Santa Clauses with beards and red hats. They will give festive cheer to your home making it warmer and more beautiful. Hanging Christmas decorations in a shape of gingerbread hearts. They will add a bit of cheer to every home, making it warm, beautiful and very tasty. White angel figurine to put on a table, windowsill or shelf. It can be also used as a Christmas tree topper or part of a nativity scene. These hanging Christmas tree ornaments will fill your house with winter spirit. You can hang them in your window, on your door or on Xmas tree branches. 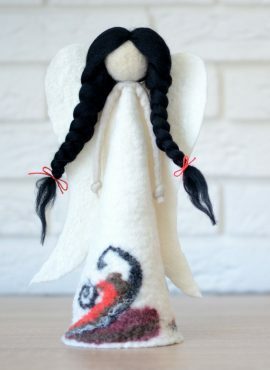 Set of hanging Christmas ornaments in a shape of cute mini angels with red dresses and lace wings. They will add a bit of Christmas cheer to every home. Set of mini Christmas trees with shiny baubles. These felt holiday ornaments will look great hanged on windows, doors, lamps or Christmas tree branches. This Christmas decorations set will make every home more beautiful during Xmas time. With seven types of holiday ornaments it is really unique!